Aizawl, Apr 15 : The Joint Monitoring Group to monitor the implementation of the Suspension of Operations signed between the Mizoram government and the Manipur-based Hmar People's Convention (Democrats) would hold a meeting on Friday next, officials said. 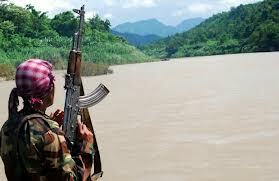 The meeting would be held at the Mizoram-Manipur border village of Sakawrdai. It would be presided over by the chairman of the JMG H Ramthlengliana, SP CID (SB) and would be attended by two officials and three members representing the HPC (D), they said. The meeting would deliberate on the date and place for resumption of talks between the Mizoram government and the Hmar outfit and also discuss the observance of the bilateral SoO signed between the two parties on January 31 last in Aizawl. The Mizoram government and the HPC (D) had earlier signed SoO for six months on November 11, 2010 but the proposed resumption of talks could not take off due to differences between the two sides which resulted in a massive crackdown on the Hmar outfit. Top leaders of the outfit, H Zosangbera, Lalropuia and Lalbiaknunga were arrested by the police during 2012. Zosangbera was arrested from the Indira Gandhi International Airport in Delhi on July 17 while Lalropuia and Lalbiaknunga were arrested from the Silchar Airport in Cachar district of Assam on June 10 last. All the arrested HPC (D) leaders were released on bail and the talks were initiated again during the first part of this year. The HPC (D) has been demanding a separate autonomous district council for the north eastern part of the state adjoining Manipur under the Sixth Schedule of the Constitution.